It’s been two weeks since I’ve had a lesson, first because I had things to take care of at home and then because my trainer was away at a show, so this week I get to ride twice. Today was the first of the two lessons, and what a relief to be back in the saddle. I rode Bella again and I think that’s good for me. She’s a good girl, but difficult in very specific ways that are things I need to work on as a rider. The continuity of working with her to improve on those things has been nice. The major issue I had today was finding my spots. Sometimes when you approach a jump, you’re at the right speed and rhythm that the take-off feels natural; it’s the obvious, reasonable spot. That didn’t happen today. Every jump we took felt like a negotiation. I never felt like I was getting enough impulsion from Bella to make the jumps smooth (largely due to my lack of exercise lately and my legs getting a little soft). Without enough impulsion, we should have waited and added another stride. But she and I both didn’t seem to want that. I wanted us to be going more forward and taking the longer spot so I was pushing for that right up until the jump. She would take the longer spot, which is what I wanted her to do, but I was then surprised by it and left behind because her lack of forward movement was telling me she was going to add a stride. When I stopped letting her make the decisions and started actually being a rider, things went better. I forget that she’s quite young and needs a bit more direction than the horses I’m used to riding. I pushed and pushed for the forward spot but when I saw that I wasn’t going to get it, I started waiting and adding. I also think I forget how small she is. We weren’t jumping high, but shorter legs means shorter strides. She’s not tiny, but she’s just a little bit smaller than I would prefer. I have to remember that and ride the horse I’m riding. The course we rode was two lines on the long ends of the ring to a vertical plank jump on the diagonal. My boyfriend filmed me again today, which is very helpful in identifying areas for improvement. I noticed that my shoulders are getting a little rounded over the jumps; partly that might be because I was getting a little left behind the motion but partly I might need to get back in the gym for some work on my upper body strength. We did the course several times, as I was lucky enough to be the only one there for the class. The lines kept presenting problems; one time I took out a stride on the first and added a stride on the second, and we had a run out on each of them. Finally I was able to put it all together. I’m not crazy about my equitation; I can see that I’m a little bit left behind on some of the spots and my jumping position isn’t quite right, but I feel a sense of accomplishment of completing the course with all the right number of strides and even getting the flying change on the final diagonal. But my biggest problem today was one that has been historically something I struggle with, and that is breathing. I hold my breath when I do a course. It’s the dumbest. When I was a kid and I’d be gasping for air after jumping a course, my trainer actually expressed concern that I had asthma. That seemed unlikely since I played other sports and ran around through the woods like a wild animal with no apparent breathing problems. Then we figured out that I was concentrating so hard that I was holding my breath. My trainer back in Brooklyn would remind me to breathe periodically, specifically right before the jump to decompress the tension and anxiety I was feeling with jumping basket case OTTBs in a small indoor arena jam-packed with children. Today I was extra bad at breathing. I asked my trainer to remind me as I went along; she said that she handles this by making sure to take a breath each stride. I responded that I feel like it’s an accomplishment if I take a breath each jump! This is not something I’m sure I know how to change. I’m incorporating more yoga into my equestrian fitness routine, mostly for strength and flexibility, but maybe the centered breathing in that discipline will help me in my riding as well. This is not me, but it’s what I look like when I’m dying in the psychotic spin class. After my lesson on Friday where my muscles and cardiovascular system seemed unusually exhausted, I had to stop and consider what I was doing wrong. Nearly every day, I have been doing something to get into shape, building strength, flexibility and stamina. But how much is too much? In the last couple of days, I have definitely experienced these symptoms. I skipped the psychotic spin class on Thursday night because I just didn’t feel up to it. At riding on Friday, my leg muscles simply didn’t respond, getting fatigued extremely quickly and I found myself huffing and puffing an inordinate amount after jumping a course. After I came home from my lesson, I fell into a nap so deep that I felt like I couldn’t move upon waking. All of yesterday I felt under the weather like I was coming down with something. This week I got to ride a horse like I’ve never ridden before. I’ve ridden hundreds of horses: mostly the wide gamut of schoolies, some sale horses, some former racehorses and former polo ponies, even one or two really nice horses owned by friends. But I’d never before gotten to ride a real serious show horse. The one I rode this week, Sjapoo (pronounced like “Chapeau”; it’s the Belgian spelling) was pretty amazing. When I first got on he seemed very excitable, with his ears perked up and head raised high despite wearing a running martingale. His gait was prancey and the movement vertical, and I thought to myself, “Oh great, another choppy Thoroughbred that’s going to make me feel like a total mess. Can I even handle this?” He wasn’t extremely big or strong–probably around 15.3 hands and athletic but not bulky (built like a soccer player rather than a football player). But he was clearly spirited in a way I’ve not often experienced. It was kind of like this: when I was younger, I had a Saturn. It was a good car, reliable, got me where I needed to go with its four-cylinder engine. It was a like a school horse. The road my family lived off had one lane going in each direction and a speed limit of 50 mph. There was one section that had a short passing lane right near my barn and, being 19 years old, I pretty much always felt I had to pass whomever was in front of me when I drove there. In my Saturn, this was a bit of an effort. I had to give it a good push on the gas pedal to get up that hill and around another car. But one day I borrowed my dad’s Infiniti. When I got to that stretch of the road, I barely had to breathe on that gas pedal to put the other cars in my dust. I realized very quickly that I had a lot of power underneath me and that it was important to be aware of that and be in control. That’s what riding this horse was like. He was like the luxury car of horses: very beautiful, but also very finely-tuned and powerful. Sjapoo with his owner (not me) at a show. Luckily, being a professional show jumper also meant that he was incredibly well-trained. After my initial apprehension, I just got to work doing what I needed to do as a rider to settle my mount and I found that he adjusted almost immediately. I took a little bit of soft contact on his mouth, I sat deeper and posted slower and as soon as he warmed up, he transitioned very nicely from that more strung out trot to a collected and comfortable working trot. The same was true at the canter. I took him around the ring a couple of times to get warmed up and we did a few circles; he gave me a perfect bend at just the slightest suggestion from my inner leg. Since the main trainer was back, after we warmed up on our own we went right into jumping. We started with a line of low verticals at the canter. She wanted us to get four strides in between the jumps, but Sjapoo and I came in right off the bat with three. Right before the first jump, I gave him a lot of leg like I would normally do to encourage the horse forward to his first jump of the day. But he didn’t need that much, only a light touch on the accelerator. “He’s not a school horse,” the trainer reminded me. The next time through, he came to the jump expecting it and I didn’t collect early enough. We got the four strides but it was uneven; the first jump was a little big so the first three strides were more forward and the fourth was jammed in there at the last second. The next time around, I was more prepared. From the get-go, I did everything in a more understated manner, even asking for the canter. It really took nothing more than shifting my weight and bending him slightly to set him up and then the barest whisper of my leg on his side to get him going, and in approaching it this way the transition was much nicer. Before he had kind of leaped into the canter, like a horse out of the starting gate, and then I’d have to calm and collect him quickly before we got to the jump. This time the transition was far more organized and gentle, which changed our whole approach. We went into the first jump with a perfect distance and the four strides flowed easily and naturally from that; it only took a little bit of sitting up and woahing in between to get the perfect fit. The trainer added a couple of other low jumps to make it a small course, but for me, the line remained the main event. After a few times through, she raised the jumps in the line. I took a look at the second one and told her, “That’s probably the highest I’ve ever jumped.” It was a vertical of about 2’9″, not very high in comparison to those 5’9″ jumps I watched people take in the show last week. I may have done 3′ once back in the day, but I’ve never had much opportunity to do anything with much height, partly due to space constrictions and largely due to horse limitations. She said not to worry about it and told me to take the line in a forward three this time around. As we approached the jump, I could feel Sjappo’s excitement match my own. 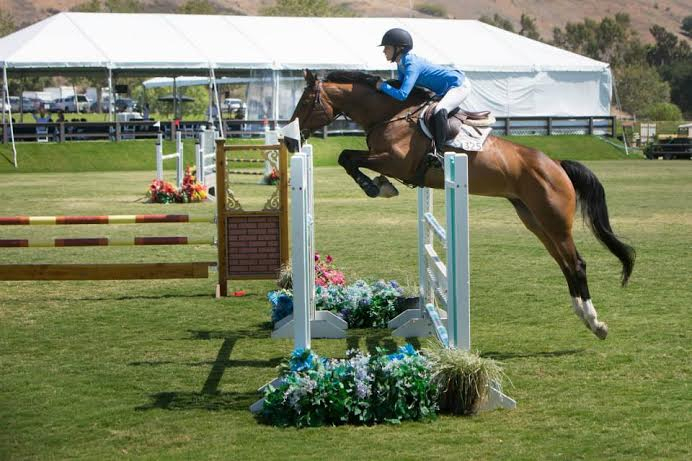 Horses that love to jump really perk up once things get going. I spurred him on with a little leg on the approach to the first jump, keeping light contact on his mouth. We cleared the first one and had three long, smooth strides to the second and when he took off, it was beautiful. We soared. I could feel myself break into a huge grin in the air, quite literally just elated. Often when training and working on a course, each jump is like a piece in a puzzle, a thing to be solved. That’s fascinating and I love that kind of work. But riding such a knowledgeable and responsive and athletic horse took the experience to another level. It reminded me of the beauty and grace and the pure fun of jumping. It made me want to do it again and again. More, and higher. 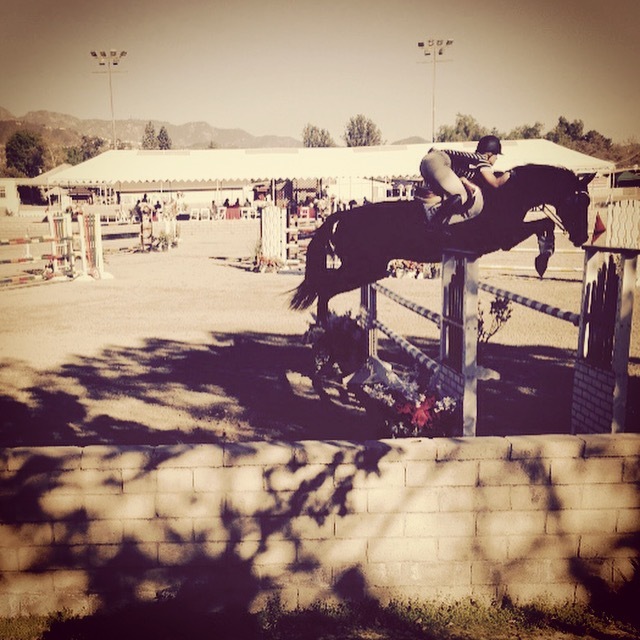 I think there are three aspects to equestrian fitness. The first two are strength and stamina, and I think the third is one that is often left out: flexibility. I’ve found this to be the most difficult thing about coming back to riding as an adult. When I started riding again about two years ago after my nearly decade-long hiatus, of course my muscles were not in shape. It was hard to grip with my legs; it was even more difficult to squeeze a slow horse to move on. It was very hard to hold my upper body still. But I had muscle memory helping me out there. So my muscles knew what to do and would instinctually do it even though they weren’t really strong enough. It’s a lot faster and easier to train muscles that already know what to do and simply need to get stronger to do it than it is to start from scratch and teach them what to do. It’s something my riding buddy and I talked about a lot, how we couldn’t fathom starting to ride at our age if we hadn’t had so much experience in our youth. Training my muscles to get stronger wasn’t too difficult, and I noticed a difference there right away. Every time I’d go to the gym to run or to do the leg weight machines, I’d see results; I’d be able to run faster and longer, or I’d have to put the weight up on the machines. But I wasn’t seeing the same results when I rode. My legs were objectively stronger, yet not a great deal more effective at doing the things they were supposed to do on the horse. The amount of time it took me to warm up seemed to be the issue. I’ve noticed as I’ve aged that in general it takes longer to warm up. This is even true on the pitching mound, where I used to be able to throw a few warm-ups and then step right into the first inning and now if I don’t get to a game early and go through a whole warm-up routine, I won’t hit my stride until the second or third. In my riding lessons, it was taking me most of the lesson to get warm—flatwork was agony and it was like I was just getting started when I took my first jump. I tried stretching at home before the lesson, doing a little light yoga and calisthenics to get the blood flowing, but by the time we drove out there and mounted up I would be cold and inflexible again. Warming up before a big exertion is useful and necessary, but there’s a lot of controversy about whether stretching before exercise is helpful at all for performance and recovery. But it’s not just on the horse that I feel my flexibility has become limited; it’s all the time. The area between my lower back and my knees, including lumbar muscles, my hips, hamstrings, and IT band seem to be all jammed up all the time. I feel them tightening and pulling on each other when I walk or sit. So warming up isn’t the only issue, it’s my general flexibility. All of this has led me to do some research into the anatomy of these areas. The thighs are particularly interesting. Most people are familiar with the quads and the hamstrings, but there is a whole group of muscles called the adductors on the interior of the thigh that work to keep your knee rotated correctly and your leg stable. Looking at a diagram of these muscles, I was able to pinpoint the one that seems to be the hardest for me to stretch when I’m riding: the gracilis muscle. It’s the most superficial of the muscles on the interior of your thigh; a long, thin muscle that goes from your pubic bone all the way down to your knee. It is involved in the flexion of both your hip and knee and it’s the muscle that prevents all of us from being able to do the splits. When you’re riding, it’s the muscle that is directly against the saddle, the first line in holding yourself onto the horse and keeping your knee closed and bent at the correct angle. 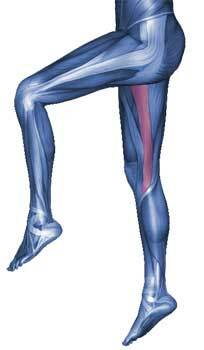 The gracilis muscle extends all the way to the knee. 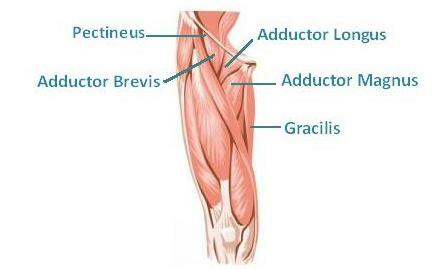 Adductor muscles in the thigh. Merely strengthening this muscle is not enough. I’ve spent plenty of time over the last several months using the adductor machine at the gym (and its counterpart, the abductor) to strengthen those muscles. But when they are tight, they aren’t particularly useful to me. I can’t access the strength I need from them–to let my leg really lengthen and wrap around the horse–if there’s no flexibility there. So now I’m trying to seek out exercises that will specifically target flexibility in that area. My first thought is yoga. I’ve been going to a class once a week for the last few weeks but haven’t gotten much out of it physically because it was very meditation-focused; I’ve now found a different class that is more anatomy-focused and it seems to be a better fit. I’ve only gone to that one once but will continue to go weekly to build flexibility throughout my body. I will probably also do some practice at home using poses that are focused on this region. I found this informative blog post with a list of poses helpful for healing, strengthening, and stretching the adductor muscles. 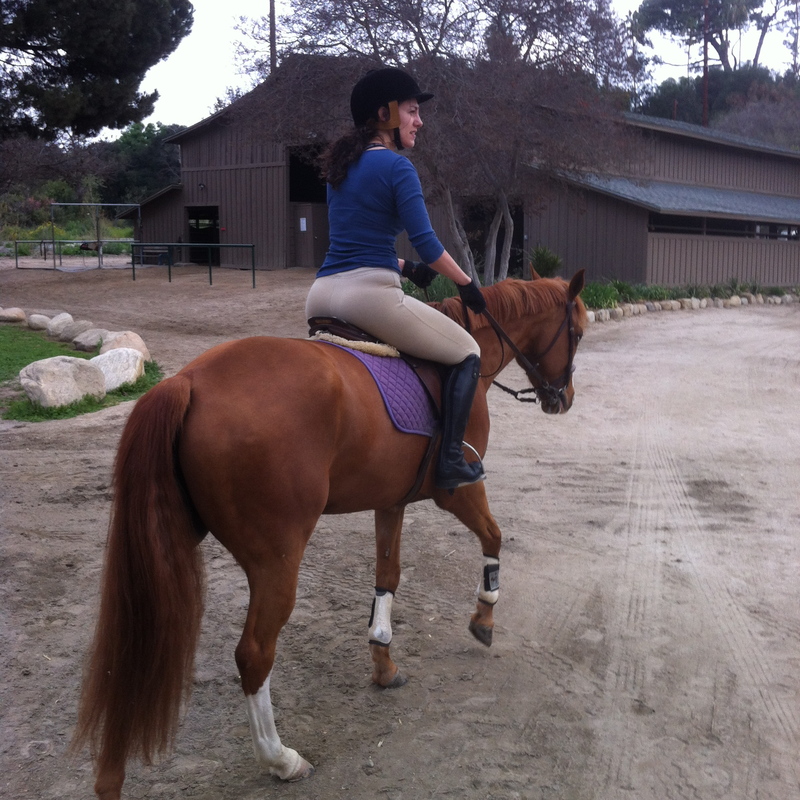 I rode Bella again yesterday, the small chestnut mare I rode in my first lesson out here. No one else from my regular jumping class was there and the trainer is still out of town at shows, so I rode again with the assistant trainer and two young girls. The lesson turned out to be a good challenge. I brought my saddle along with me and rode in it for the first time in over a decade. It felt really, really good. I asked the trainer her opinion on whether it was too small for me, to which she answered, yes, it is. But not by too much. She said it’s noticeable but not glaring, that I could use a bit larger one but if it’s comfortable for me there’s no reason to run out and get another saddle. I’m going to keep riding in it for now because it is so comfortable. The interesting thing I’ve noted about riding with this trainer is that she is very structured in her approach. Flatwork is not just a warm-up, it’s a training session that builds individual skills that will be used when jumping a course. In this lesson we really focused on turns and timing. When warming up at the trot and at the canter, she had us do a similar drill to one she’s had me do before: alternating extending and shortening the horse’s stride. This time, instead of extending on the long side of the ring and shortening on the short side, she had us extend on the short side and rein it back in for the long side. This is a lot more difficult. This drill not only warms up the rider and the horse (all that extending takes a lot of leg and of course the horse is working hard to move that fast), but it’s also incredibly useful for jumping courses, especially lines. When you’re in between the jumps in a line you often need to either move up the horse to take away a stride or pull them back to add a stride, and this exercise builds those skills on the flat. It teaches you how to get that extension out of your horse by squeezing with your legs and how to get them to come back by sitting deeper in the saddle and using your back and hands. It also trains the horse to be responsive to those aids and flexible in changing her stride. The next drills worked on turns. This trainer is big on circles, really emphasizing pushing the horse out with your inside leg while keeping her moving forward and on track with the outside leg. There’s a huge temptation to use your inside rein to get the bend; it turns the horse’s head and should be used subtly and indirectly to help create that silhouette. But when you’re thinking about jumping a course with some tight turns in it, you don’t just want to be wrenching your horse’s head towards a jump at the last minute. That will prevent you from coming in straight and will likely earn you at best a knocked-down rail and at worst a flat-out refusal. Instead, you want to be prepping your horse for the turn with your seat as early as possible–on the landing, if not in the air. To that end, we did two really useful exercises before jumping a course. The first was not dissimilar from one I’ve done with her before, doing a circle around different points of the ring with a focus on bending. But this time she upped the ante and took away the ability to use the inside rein at all; we had to take both reins in our outside hand and get the circle and bend entirely with our legs. This was hard. Imagine sitting on a bike and trying to make it go in a circle without touching the handlebars. And then imagine that the bike is 2,000 pounds and has a mind of its own. Pushing the horse out with your inside leg is so much work. Think of how much effort you have to put with your whole body into pushing a heavy piece of furniture; this is like that, but just with one leg. We had to canter in over the two center poles and then make the tight right turn to canter the right pole, then come around and go through the center poles again to make the tight left turn to the left pole. The turns were very tight. The first time it took all of us by surprise and everyone did that last-minute jerk on the reins that made a very messy, bowed-out turn and did not get a straight approach. The trainer illustrated what needed to be done in a really helpful way though (to me at least, but not really to the two little girls): she asked if I’d ever driven a truck. I said I have, and so she likened turning the horse to turning a truck; you always have to go a little bit further out in turning the front end of it in order for there to be room for the hind end to get around the turn and come in straight. So the next time through, more prepared, I did much better; I set my horse up right after the center poles by switching my weight to the outside stirrup and pushing the horse over with the inside leg. It went pretty well. I was so focused on making my turns well that I got a little messed up about my spots. This was another situation where I needed to sit back and wait; Bella knew where she needed to take off and it was a stride closer than I expected her to. I have a tendency to sort of throw myself forward in the saddle; it’s almost like I’m trying to jump for both of us. It’s something I really have to work on, for two reasons. The first is that if I’m flinging myself forward and my horses refuses, it’s curtains for me. I’m going to go over her head. The second is that it’s totally counterproductive to my horse. When a horse jumps, the power all comes from the hind legs for the take-off, so she needs to somewhat rock back on her hind legs first. If the rider is ahead of the motion of the jump and her weight is forward over the horse’s neck, it makes that movement so much harder. Jumping position should happen over the jump, coming up to meet your horse’s neck and arched back, not before take-off. I would have liked to keep perfecting the course longer, but we only had time to do it twice. It’s very useful to build up skills dong all of these flat exercises and I’m glad for the experience, but there are drawbacks, like not having a whole lot of time for actual jumping and also being pretty fatigued by the time we get to it. Hopefully next week I’ll get a chance to focus more on courses and take a break from all this intense flatwork. To top off a good riding lesson and make the day extra horsey and wonderful, I also got to go watch some show jumping. My boyfriend and I went out to the barn in Burbank where they were having a competition and it was very nice. There weren’t many spectators, so we got to be right up close to the action. I don’t honestly think I’ve ever been this close to a horse jumping so high; the fences in the class we watched were 69″ (or 5′ 9″–three inches taller than me). I’ve seen it from far away in a grandstand and I’ve seen it on TV, but when you’re up close it really drives home the athleticism of these animals. You can feel the presence of such a huge body and the exertion of it leaping into the air carrying a person on its back. It’s pretty unreal. And exciting and beautiful, as well. Watching the riders take the course, I paid particular attention to their turns and found it to be very predictive. It was easy to see when someone was going to knock a rail down and almost all of the time it was because of a bad approach due to lack of a good turn. That’s way easier to see when you’re in the stands than it is when you’re down in the ring, especially since show jumpers don’t get a practice round. There’s no opportunity to see the course from horseback prior to entering for your round, there’s only a walk-through where riders and trainers apprehend the course on foot. If I ever get a chance to ride in one of these shows (and I want to, now maybe more than ever), I’m definitely going to keep that in mind on my walk-through and pay close attention to looking at where I’m going to make my turns. A rider (not me) at the show jumping competition.